This week saw another landmark in the timeline of Daisy Von Schnorkenheimer’s life – she went to the vet to be spayed. Yikes! Surgery?! Well, we all felt it was time, and I trust Dr. Timothy Plunkett with my fur babies completely. Fairfield Veterinary Hospital cared for my sweet Corky, then Miss Violet. I now entrust Daisy to their capable and tender hands. There is a bit of controversy around having your pet spayed/neutered or not; and I agree it’s a personal decision. I understand someone’s choice not to spay or neuter, especially if that someone owns AKC dogs. Such pampered pooches should indeed be carefully and responsibly bred, for who wouldn’t want a miniature schnauzer puppy of their own?! But for us ordinary dog owners, and dog lovers, spaying and neutering is a way to better care for your pet. Research has shown spayed dogs are less likely to run away from home (looking for romance), happier without the discomfort and confusion of estrus, and healthier in the long run. Neutered dogs tend to be less aggressive and territorial, a consideration if the dog is a family pet, thereby making it less likely he will mark his territory inside the house. Plus neutering (and spaying) your dog minimizes the risk of a dogfight, since romance, dominance over other dogs and over territory are the leading causes of such battles. There is a reduction in orthopedic health problems and behavioral issues in “fixed” girl dogs. Additionally, a lady canine’s risk of uterine infections, mammary tumors, and certain cancers can all effectively be eliminated by spaying her at the right time. Well, when is the right time? Your puppy can develop health problems if spayed too early. She needs her reproductive hormones present for several months to allow her bones, joints, and internal organs to develop normally. Some veterinarians suggest you spay after her first heat, others say before her first – please discuss the pros and cons, for your particular dog and her particular breed, with your vet carefully before scheduling the surgery. There’s no rush; but there’s a right time and many wrong times to have such an operation. And after she comes home? How do you care for your Post-Surgical Princess? Again, Dr. Plunkett to the rescue! After Miss Violet had a bladder surgery, he advised we get a human baby onesie to help keep her warm and comfortable, and to prevent her from nibbling her stitches, without that nasty, shameful cone. 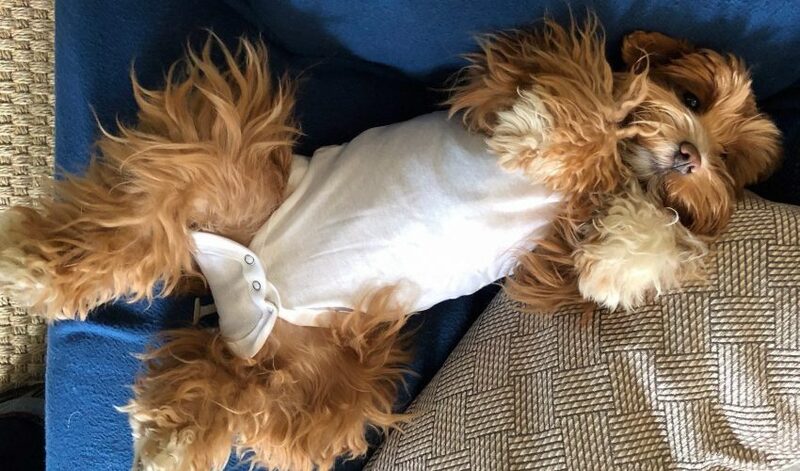 So, I got a three pack of organic cotton onesies from Gerber for my furry patient. This way she can heal in dignity with style, and not look like an upside-down lamp. Miss Daisy doesn’t need her sense of direction and her movements affected while she gets over the trauma of her surgery. All she needs is a cozy second skin, to allow her to continue her normal routine, whilst keeping the surgical site dry, clean and protected. A happier Daisy means a faster recovery; and a happy Dog-ter means a happy Dog Daddy! Besides, I would never wear a Cone of Shame myself! I’d rather wear torn, frayed jeans, running shoes, white athletic socks and a baggy black shirt, with most of the buttons undone. Wouldn’t you? !